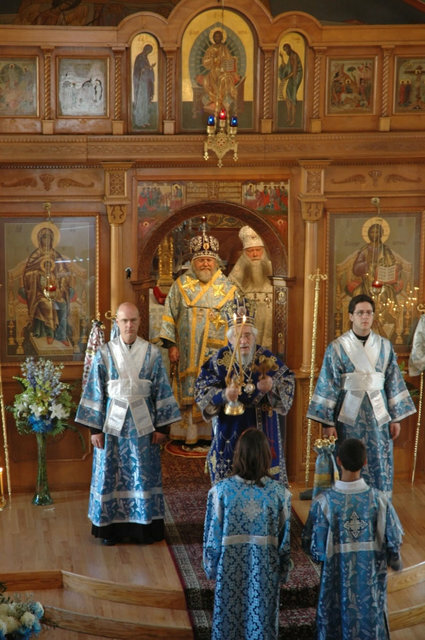 On October 14, 2008, the feast day of the Holy Virgin Protection Cathedral in Chicago, His Eminence Metropolitan Hilarion officiated at Divine Liturgy and led a festive moleben and procession of the cross. His Eminence was joined during Liturgy by His Eminence Metroplitan Christopher of the local Serbian Orthodox parishes, the local Romanian Archbishop Nicholas, His Grace Bishop Peter of Cleveland and His Grace Bishop John of Caracas. Praying in the altar and partaking of the Holy Gifts of Christ was His Eminence Archbishop Alypy of Chicago and Mid-America. Joining these hierarchs for all-night vigil on the previous evening was His Grace Bishop Longin of Novo-Gracanica. Below are photographs of the event.